Home Unlabelled Fastjet announces launching of Dar - Mbeya flights; tickets already on sale. Fastjet announces launching of Dar - Mbeya flights; tickets already on sale. 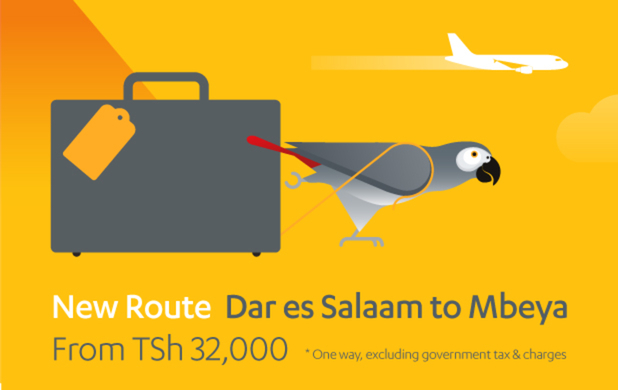 Fastjet, the African budget airline, has announced the launch of their new domestic route between Dar es Salaam and Mbeya, with the first flight taking off on 1st November. According to the announcement, fastjet will be flying between Dar es Salaam and Mbeya 3 times a week with from just TSh32,000 (excluding tax and charges). Fastjet says they have had a huge demand from customers to launch this route, so would like to thank the government, airport authorities, and all the people involved in making the necessary improvements to Songwe airport which has enabled the Airbus A319s to land safely. Precision Air and Tropical Air already flies between Dar es Salaam and Mbeya’s established airport (MBI).